This is a Communist Party showcase for its efforts to tame the Xinjiang region, the heartland of China’s often restive Uighur Muslim minority and an unforgiving terrain. The free or low-cost houses are assigned alternately to Uighurs and Han Chinese, who work side-by-side in greenhouses and send their children to school together. 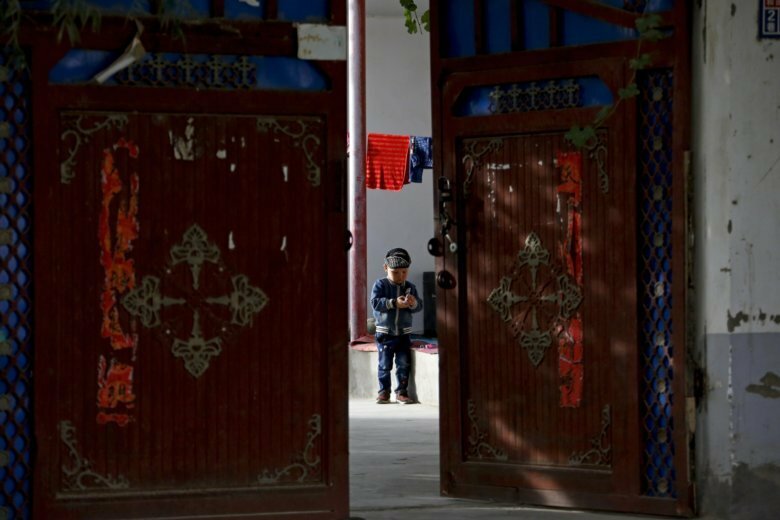 It is the future the party envisions for Xinjiang after a massive security crackdown that has sent by some estimates more than a million Muslims to internment camps, and many of their children to orphanages. But a closer look at what the party calls “ethnic unity” reveals what isn’t there: mosques for Muslim worshippers, or traditional Uighur brick homes, often adorned with pointed arches and carved decorations. In their place are colorful murals of what authorities consider to be scenes of unity, such as a Uighur man and his family holding a Chinese flag. In the village’s new public square, Uighur children banter with Han Chinese children in fluent Mandarin, the language of the Han majority, rather than in their native tongue. Young Uighur women wear Western clothing without the headscarves that are part of traditional Muslim dress. While these are voluntary settlements with economic benefits, experts and Uighur activists believe they are part of an aggressive government campaign to erode the identities of the Central Asian groups who called the region home long before waves of Han migrants arrived in recent decades. Construction of the village began in 2014 with a planned investment of 1.7 billion yuan ($247 million). The goal was to build 5,000 homes and 10,000 greenhouses, according to local reports, to turn a large swath of desert into farmland and create a shared prosperity among Uighurs and Han Chinese. Around the same time, the Communist Party came forth with a new strategy focused on ethnic mingling. Subsequently, at least one county offered financial incentives for Uighur-Han intermarriages, while others have launched programs encouraging Uighur families to move into Han Chinese residential areas. China is building several such mixed settlements in Xinjiang. A similar village is under construction as a tourist attraction near Kuqa, around 600 kilometers (372 miles) from Hotan. A concrete yurt known as the “solidarity farmhouse” already has been completed, and a giant sculpture of a pomegranate is prominently placed at the center of the village to symbolize unity. Yet there are also signs of enduring mistrust. As elsewhere in Xinjiang, high walls around homes are topped with barbed wire, and police officers stand guard from behind fences at the entrance of the village. Adults don’t mix socially — at night, a group of Han Chinese dance in the square while the Uighur residents chat among themselves on the sidelines. A Uighur farmer who moved to the village last September says authorities provided him with free housing and utilities, two greenhouses, a small orchard with grapevines and a barn with sheep, chickens, and pigeons. But the crackdown on Muslims in Xinjiang has made it risky for ordinary Muslims to discuss their religious practices, and when speaking to reporters in front of government observers, he insists he was never a Muslim. Another Uighur farmer in his early seventies, Muzitohtahon, says he is no longer a Muslim. Uighur and Han villagers do seem united by at least one factor — their desire to escape poverty. Rural areas in Xinjiang, including Hotan, rank among the poorest in China, with many families lacking even the most basic utilities and food. The financial incentives are also a key draw for Han Chinese from other impoverished regions of China. Last May, 58-year-old Xiao Erying, who is Han Chinese, moved to this village from her hometown in the southern province of Hunan, over 4,000 kilometers away. “It is better than our hometown,” she says, as she rakes sheep, chicken and cow manure inside her greenhouse. For 60,000 yuan ($8,700), her family bought a two-bedroom home with a small orchard and two greenhouses. The two grandchildren she lives with are given free tuition, school lunches, and even a free set of clothes. Xiao admits she doesn’t speak Uighur and cannot communicate with her Uighur neighbors, but she says the layout encourages interaction. In a greenhouse a few dozen meters away, Uighur Abudu Mijiti has just begun planting chili with his wife. He moved to the village three years ago to make a more stable living. Two of his three children go to the local school and are fluent in Chinese, he says, as a government minder looks on. On the surface, the picture presented at the Hotan Unity New Village reflects the government’s vision of an “idealized place,” says David O’Brien, an expert at the University of Nottingham. Yet the settlement remains only partly inhabited. The city says there are 534 households in the compound, but most of the houses are empty. A drive through reveals rows of empty greenhouses and house after house with a sign that says “sealed off” patched onto padlocked or chained gates. Under the sweltering desert sun, one Han Chinese farmer tending to her plot of Chinese chives complains that water is scarce and her previous batch of chives had to be thrown out. Even when the crops work out, the chives sell for less than one yuan (14 cents) per kilogram. In the absence of government minders, the woman goes on. “Ordinary people are not able to eat meat. The officials can, but not the ordinary people,” says the woman, who declines to give her name out of fear of retaliation. As dusk approaches and temperatures fall, residents slowly make their way out onto the streets to enjoy the evening breeze. On the Uighur side of the street, a young Uighur woman rests on an electric bike after a day’s work, looking at her cell phone. Asked what she thinks of unity, she looks up. “Unity?” she asks. Silently and slowly, she shakes her head, and returns to her phone. This story has been corrected to show Xinjiang is a region not a province.